This weekend we have been up on the North Norfolk coast again, staying at the in-laws caravan. I had hoped to set many CMs, a couple of VS and a trigtastic cache. Unfortunately my driver, DRSInAlc, a newbie cacher, was in a hurry to get to the caravan and crack open the first crate of lager! Today, though, we took the geotots out whilst the wife muggle cleaned the caravan before departing, a task she gets to with relish and usually takes several hours! So we set off and I set the Village Sign cache at High Kelling and a random cache in the place of one that has now been archived. At GZ it was an easy find and I explained to DRSInAlc why it was here. Next off it was time to walk over the marshes to the beach to burn off some geotot energy so they'd sleep in the car on the way home! 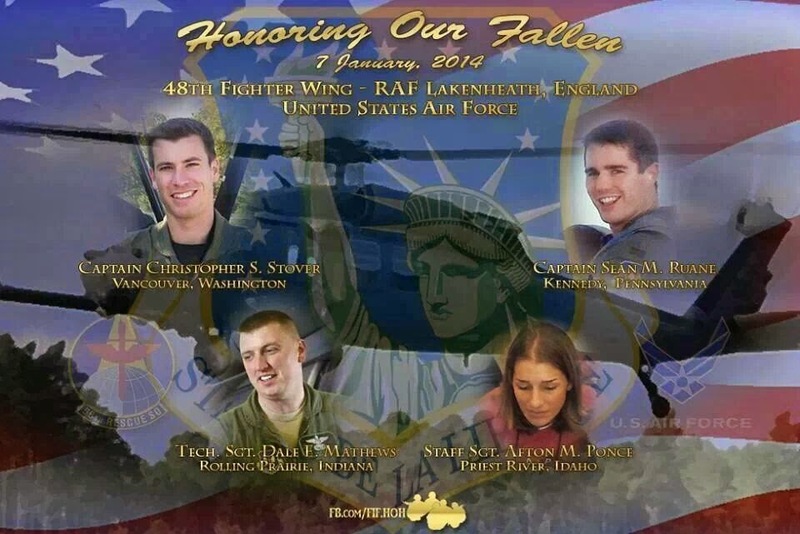 When we were about 500 yards into the 1000 yard walk to the beach I remembered that this was near where the USAF helicopter had come down and postulated that the actual crash site must be somewhere between where we were and Cley. Then I had a thought to check the live map in c:geo, rather than just the saved caches and a new cache appeared that I hadn't seen before called Jolly 22. What a massive coincidence, well, we decided we had to go have a look as we were now only 342 yards (ok, metres) away. 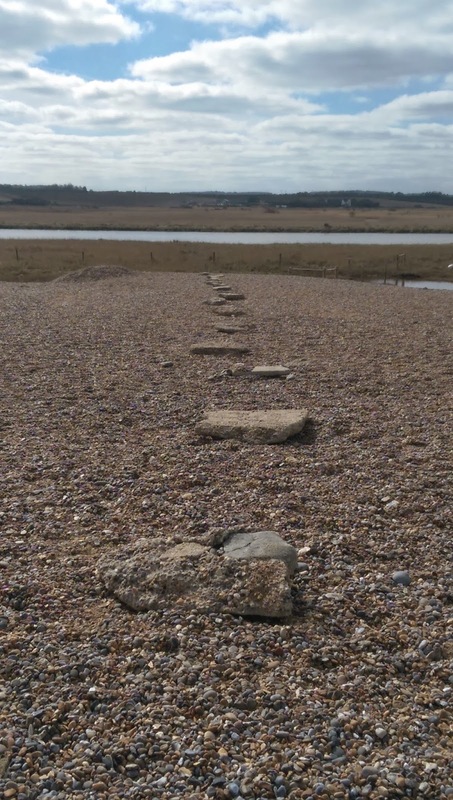 As we approached we could see a line of rocks in the shingle and followed them all the way to GZ. 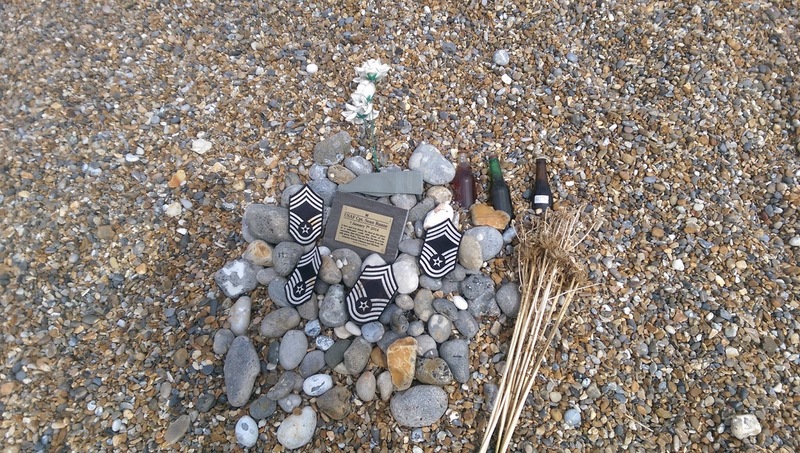 Once at GZ, which was well hidden from casual view by the shingle bank, we found a very nice memorial plaque, with some bottled beer, presumably the crews favourite tipple, surrounded by large beach stones. Very close by was the perimeter fence, presumably of the actual crash site, with flowers attached to it as well as a very large ammo can containing the order of service from the memorial service, a coin which looked like a GC but wasn't, the crews mess glasses and their rank badges. Unfortunately these were a little damp so I left them on the memorial to dry a little whilst we were there. Next to the large ammo can was the very obvious geocache, itself a large ammo can, dwarfed by the other one! Inside it was a geocoin which I soon pocketed and the log book. 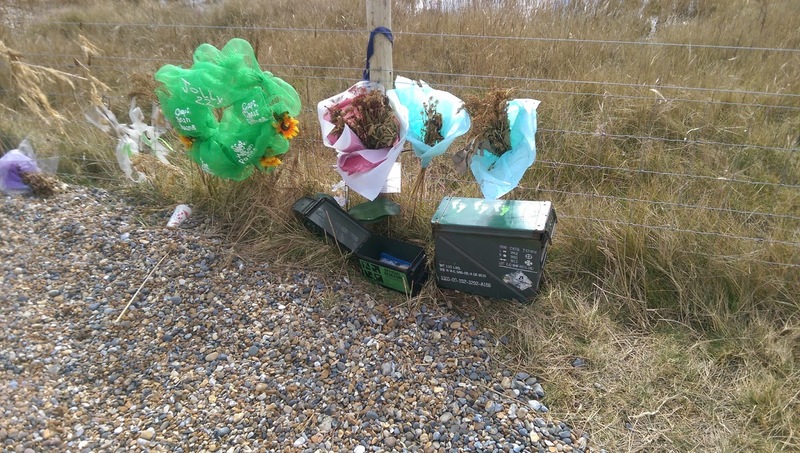 It was very moving to be here and hopefully no unscrupulous geocacher, or muggle, will liberate these ammo cans, and thank goodness this was placed after the tidal surge! A superb place, and, as I explained to drsinalc, this was the whole point of geocaching - to take you to places that you would never otherwise know existed.